A little blurry, but at nite the light is bad. What do you think of my crumb blocks. I want to put sashing between them, otherwise they mush too much. So I am testing sashing. From left to right: red, purple, black with navy below it, and yellow. I think I might go with the navy, since I have a bunch of 1 1/2 inch strips already cut the scrap box. Just thought of lime green. Will try tomorrow when the light is much better. There will be one more row down the side and then borders. Just ran out of room on this table cloth design wall. I have to pin everything on or they start falling off when I add new ones to it. Do you see the 16 patch black and white check in the middle? 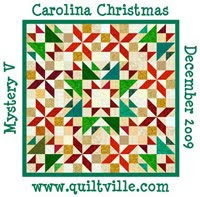 That is left from a border of a Christmas wall hanging that I really need to get quilted. 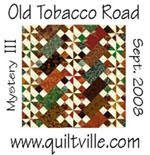 There are 9 patches left over from RRCB, Bonnie Hunters mystery quilt last Nov. Wonder what her new mystery will look like. We will have to wait and see. The first clue goes up on her blog Nov. 18. Check out Bonnies Blog if you want a mystery that will turn out great. I have done 3. I love your crumb blocks. It is fun to play with scraps. Crumb one crumb all! Looks great Vicki! Looks great. Try adding a zinger color sashing. Love it. Beautiful! Looking forward to seeing the sashing you choose. The crumbs are looking good, I think that that any sashing will be ok.
WOW! 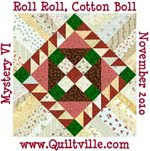 I love this Crumb Quilt. I've never heard of this...but remember I'm from Wisconsin. We're buried deep in snow most of the time. Is there a pattern? Looks like it would take forever!